Away back in November, I asked my readers for blog topics, which believe it or not, I'm still working my way through. Joy gave me the topic "tattoos", and today is the day, because it's my 32nd birthday, and while 32 is an unexciting age, I'm going to commemorate my first birthday back in the States with a new tattoo. I got my first tat when I was 20 and in college. At the time, I was taking Arabic classes, and though I never felt like I was really getting it, I loved it and was doing pretty well with it. The script is beautiful, and I spent a lot of time practicing my handwriting. I knew that if I were ever to get a tattoo, it had to be something that meant something to me and would always mean something to me. After a lot of deliberation, I chose the word "faith", for the reason that I may not always have love or hope, but I'd always have my faith. There was an Arabic calligraphist on the U of A staff. 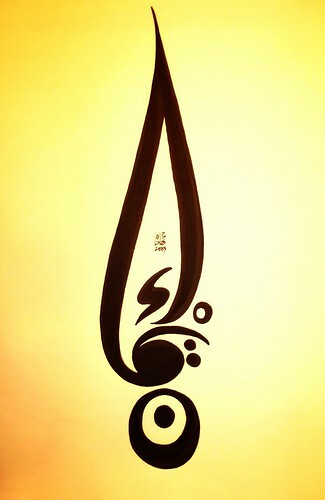 I asked him to create a calligraphy design for me for the word iman. He gave me a nice design, but it was a classic calligraphy design, not quite what I had in mind, and it wasn't very tattoo-able. I then discovered a contemporary calligraphist online, Nihad Dukhan, and contacted him. For a pretty little sum I now can't remember (well over $100), he designed me a beautiful iman, which I loved enough to have tattooed on my right foot. By the way, did I mention that both my foot and my spine are incredibly bony places for tattoos, and I don't like pain? Yeah, the actual act of getting inked is not my favourite part. For many years, I've been itching to get that last tattoo - love - but it's never worked out. I've never been really sure where I'd like to have it. My left tricep has always been my go-to place, but for various reasons, I've never quite committed to it. I've also considered my right wrist and my right side under the ribs. I even briefly considered my right foot but just didn't want my tattoos to be that symmetrical. The three greatest gifts are faith, hope and love. Love is meant here in the brotherly sense, the universal sense, the love for one's neighbor and all mankind. It is also the greatest of all the three gifts. Nothing as of yet has broken or destroyed my love for other people. So on my 32nd birthday I once again return to Mr Dukhan's site for my tattoo. I love this design as much as the others... and again, I'm happy I don't have to pay for a custom drawing! I just need to decide where... my wrist or my tricep. I hope to get it done this month. I'm pretty excited!! Makes me think that putting "love" near your hand would be appropriate. So maybe the wrist... ? I like that, Ruth. Originally I thought the wrist because of the nails in Jesus' hands. That's not really the reason now, but I do like the idea of love being something you do, thus having it on my hands.... I am leaning towards wrist to be honest!